Located about 55 miles north of Jacksonville and almost 70 miles southwest of Savannah, Brunswick is tucked behind Jekyll Island and Saint Simons Sound on the Brunswick River west of Intracoastal Waterway (ICW) Mile 680. Although there is only one marina in Brunswick, the town is welcoming and interesting to explore. Ashore there are a wide variety of restaurants, many serving a namesake dish called Brunswick Stew, which often accompanies a plateful of shrimp. Many people stop in Brunswick before making the day-long trek down to Jacksonville. Mark Carr, a captain in General James Oglethorpe's Marine Boat Company, was the area's first settler. He established his plantation as early as 1738 on 1,000 acres along the Turtle River, an area known as Plug Point. In 1771, the Royal Province of Georgia bought Carr's Fields and laid out the town of Brunswick in the grid style following Oglethorpe's plan for Savannah. In 1797, the General Assembly transferred the county seat from Frederica on St. Simons Island to the town Brunswick. The town is named after King George II's ancestral home, the Hanoverian duchy of Braunsweig-Lunenburg, Germany. Following the Revolutionary War when many other towns and cities were distancing themselves from their English heritage, Brunswick retained the English names of its streets and squares - Newcastle, Hanover, Gloucester, London, for example. 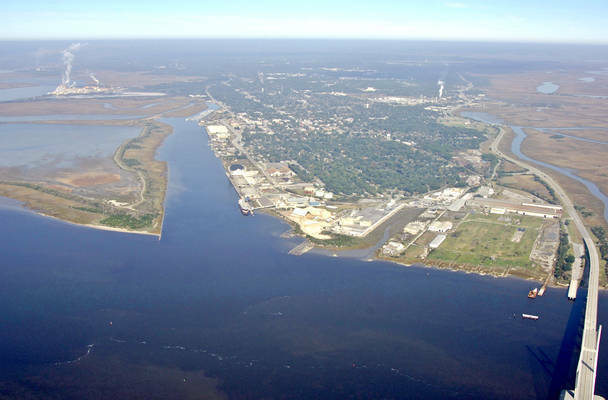 Today Brunswick is home to a thriving port, the deepest natural harbor in the area. As the western-most harbor on the eastern seaboard, as well as the Shrimp Capitol of the World, Brunswick's waterfront bustles with activity. The city is also home to Hercules, one of the oldest and most important yellow-pine chemical plants in the world. Other wood products, including Georgia-Pacific's fluff pulp, are shipped from Brunswick to worldwide destinations. 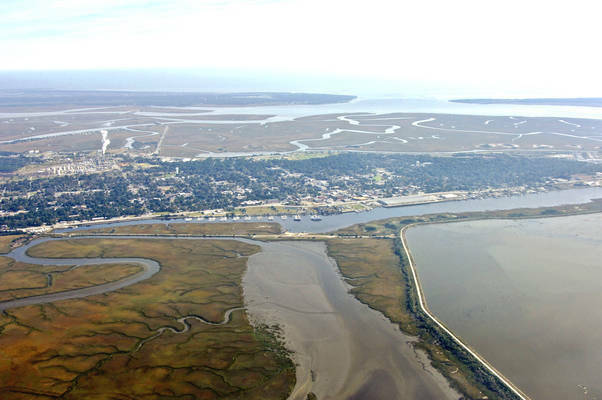 The city of Brunswick is reached via a passage from Saint Simons Sound through the Brunswick River and on into the East River at the city waterfront. From Saint Simons Sound, pick up quick flashing red buoy 20 north of Jekyll Island on the Intracoastal route at ICW Mile 678. Once you have cleared quick flashing red buoy 20, chart a course for flashing red buoy 20A and quick flashing green 21, where you make a turn to the west to line up with the Cedar Hammock Range. Flashing red buoy 22 comes next, and the Cedar Hammock Range is discontinued at quick flashing red buoy 24, where you will turn farther to the west and line up for the center span of the Sidney Lanier Bridge (130-foot fixed vertical clearance). 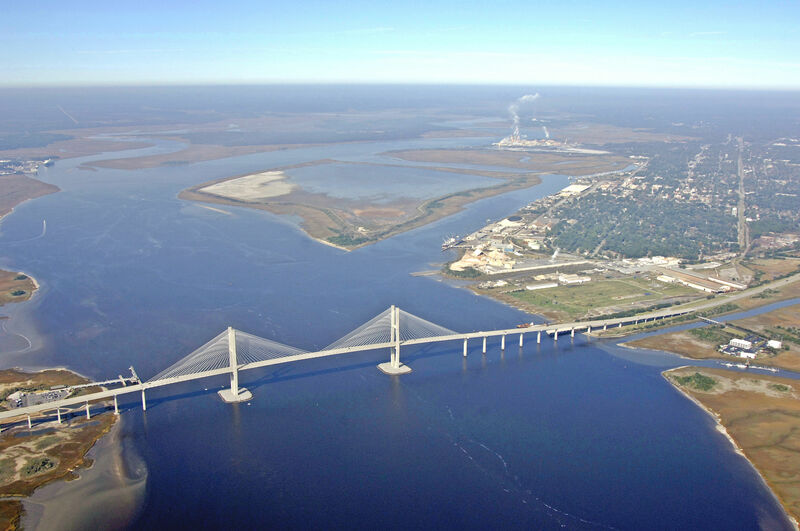 Once you have cleared the bridge, round quick flashing red buoy 30 to starboard and head up the East River into Brunswick The Brunswick Harbor Range is available to help guide you in. Keep an eye out for commercial traffic at all times. Anchoring off the Brunswick city docks is not permitted, but the Brunswick Landing Marina happily accepts transient guests and has a large lift for repairs and haul-outs. See the Helpful Links section below for a detailed calendar of events. The Brunswick Golden Isles Airport is served by Atlantic Southeast Airlines (ASA/The Delta Connection), which offers round-trip regional jet service to Atlanta four times daily. 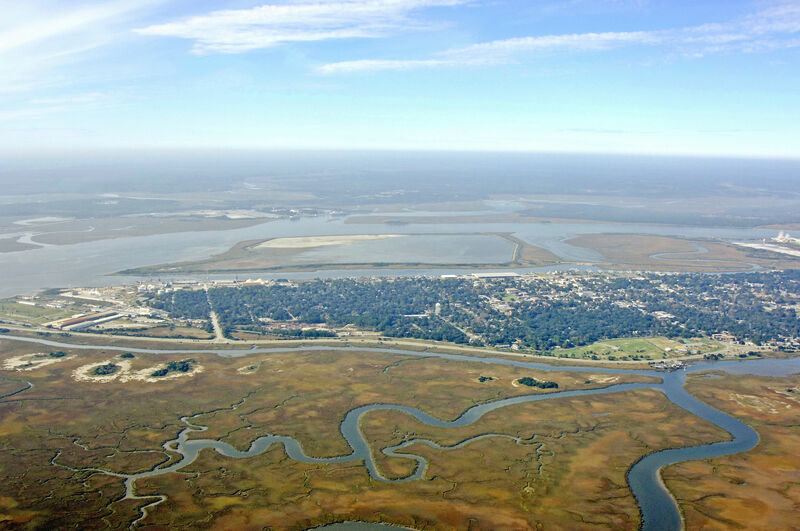 Private pilots may use Brunswick Golden Isles Airport, McKinnon St. Simons Airport on St. Simons Island or Jekyll Island Airport. No reviews yet! Be the first to write a review of Brunswick.